The most primitive forms, Utatsusaurus and other basal ichthyopterygians, are discussed on the previous page. Ichthyosauria, strictly speaking, are Cymbospondylus + Ichthyosaurus. Cymbospondylus is traditionally included in the Shastasauria. However, in the phylogenetic arrangement of Ryosuke Motani (adopted here) this genus is shown to be much more primitive, even more primitive than the Mixosaurs. Probably Cymbospondylus belongs in its own family ("Cymbospondylidae"). Cymbospondylus had a very elongate body, and the head, although large taken in isolation, was unusually small relative to the overall body. As befits its primitive status, Cymbospondylus lacked the familiar dorsal fin on its back and had only a very slight tail kink. It did however have the typical ichthyosaur pointed teeth in the long, beak-like jaws. MAK990620. Mixosaurus includes several species of small creatures about a meter in length. They are among the earliest and most primitive of the Ichthyosaurs and were the sister group of the more derived merriamosaurs. Mixosaurus remained more reptilian than fishlike in appearance, though with flippers and a small fin on the tail. It also had a small dorsal fin on the back. Mixosaurus was morphologically intermediate between Cymbospondylus and more advanced Triassic Ichthyosaurs, such as the shastasaurs. The two lineages, the mixosaurs and Cymbospondylus, actually coexisted for some ten million or so years, along with other, even more basal early ichthyosaurs such as Hupehsuchus and Parvenator. MAK990620. Characters: Spindle-shaped body, 0.7-15.0 m; lacrimal participates in nares in most forms, but perhaps not primitive for group [C97]; largest orbit of any animal (up to 26 cm); often substantial sclerotic rings [C97]; postorbital does not participate in upper temporal fenestra [C97]; reduced cheek; strong upper temporal fenestra, but lower fenestra lost except in most basal species; supratemporal probably present primitively, but lost in many derived forms [C97a]; quadratojugal present primitively [C97]; teeth in long groove without separate alveoli in later forms; vertebral centra very short & deeply amphicoelous; neural arches separated from centra and without transverse processes(? ); caudal fin in J-K species; manus 1 absent, but 2 neomorphic digits in some advanced forms; polydactyly in some, polyphalangy common and very well-developed; length of phalanges reduced; forelimbs used for steering, not propulsion; pelvic girdle not attached to spine (except Shonisaurus of the Middle Triassic); limbs reduced to steering fins; viviparous; diet varies, but squids probably common. Links: Ichthyosaur Page Home (English & Japanese); Ichthyopterygia -- The Dinosauricon; Introduction to the Ichthyosauria; ucmp berkeley museum ab24; Ichthyosaur- Enchanted Learning Software; order61.htm; Ichthyosaur fossil discovery at Charmouth Dorset UK. (after Ryosuke Motani's page, perhaps the most useful site); Kleiner Museumsrundgang (German); Faktasider om marine øgler (Norwegian); Senckenberg Fossile Wirbeltiere der Meere (German); Marine Reptiles (NOT Dinosaurs); Ichthyosauria; Rolex Awards for Enterprise - Laureates; Water Reptiles of the Past and Present; The Fernleaf: Karen Carr; The Fernleaf: Karen Carr; Wikipedia. Note: Phylogenetic position still controversial. There has been a good deal of activity recently, both generally at the base of the diapsids and, specifically, in Ichthyosaur phylogeny. In particular the "Ichthyopterygia" name has been dusted off and retooled to cover Hupehsuchus, Grippia, and a few others. Range: Middle Triassic to Late Triassic of North & South America, China & Europe. Phylogeny: Ichthyosauria: Mixosaurus + Merriamosauria) + *. Characters: ~10 m; small head; elongate, longirostrine jaws; relatively small orbits [C97]; tooth implantation thecodont, but with ankylosis at bottom of socket [M97]; replacement teeth lingual of functional teeth [M97]; tooth roots not expanded [M97]; rib articulations as in shastasaurs [S97]; diapophysis makes contact with the anterior margin of centrum in dorsal vertebrae [S97]; caudal "fins" absent; paddles short. Comments: Originally included under the Shastosauridae. Cladistic analysis by Motani 1999b shows Cymbospondylus to be more basal not only relatrive to shastasaurs but even to mixosaurs, whereas in Sander's (2000) analysis Cymbospondylus is a shastasaur, and the sister-taxon to Besanosaurus. However, study of the braincase of the closely related Phantomosaurus shows it to be the most plesiomorphic (primitive, non-specialised) ichthyosaur braincase currently known (Maisch & Matzke 2006), which supports the primitive status of these animals. ; sim9ilarities with shastasaurs being the result of convergence (large, elongate, marine animals) and shared primitive characteristics. Links: Cymbospondylus; Dinosaurios; Kleiner Museumsrundgang; Dinolist; Buena Vista Museum; BBC - Sea Monsters - Cymbospondylus; Wikipedia. Range: Middle Triassic of Europe & China (Tethys Sea), North America, New Zealand. [C97]. Phylogeny: Ichthyosauria:: Merriamosauria + *. Characters: ~1 m; maxilla large (primitive) [C97]; elongated preorbital skull [C97]; lacrimal excluded from nares [C97]; frontals & nasal roughly equal size (primitive) [C97]; upper temporal fenestra very small [C97]; orbit large [C97]; postorbital cheek region very short [C97]; supratemporal present [C97a]; quadratojugal retained primitive) [C97]; pterygoid transverse process absent in some specimens [C97]; dentition ankylosed thecodont [C97], but subthecodont anteriorly [M97]; tooth roots not expanded [M97]; rib articulations uncertain [S97]; gastralia present & well-developed, forming tightly-knit plastron [C97]; dorsal fin present; caudal "fin" little developed; scapula & coracoid very similar, coracoid less symmetrical and having sickle-shaped extension [C97]; short forefin; 4+ (5?) digits on all extremities [S97]; primitive broad, plate-like pubis & ischium [C97]; ilium short & distally broad [C97]; found in deeper waters than, e.g. nothosaurs. Mixosaurus cornalianus, photo by Ghedoghedo (Wikipedia). Another specimen. 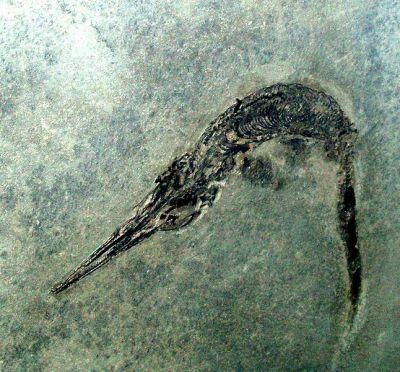 This common species is the only Triassic ichthyosaur for which complete articulated skeletons are known (Motani 1999c). References: Callaway 1997) [C97]; Callaway (1997a) [C97a]; Motani (1997) [M97]; Sander (1997) [S97]. ATW020516.